Calvin thought your church should devote half of its wealth to the poor. Does it? So how does your church budget match up to this standard? Calvin insisted that the church’s responsibility to the poor was not a marginal part of the church’s life. God appointed one of the church’s four offices for the care of the poor, and Calvin stressed adamantly and repeatedly that the deaconate was no secular office: “it was not secular management that they were undertaking, but a spiritual function dedicated to God.” (4.4.5) In other words, the way in which the church uses its wealth is not a lesser matter. It is a direct expression of the kingdom of God in our midst. We often think of the giving of offerings in church as giving to God, and rightly so. But we should not forget that often the New Testament talks about the church’s giving simply in terms of giving to the poor. When we think of pastors as those who cannot earn a living because they have devoted their lives to the church, pastors are rightly seen as being included in this category. What the church does with its wealth, then, should be a partial fulfillment of Jesus’ command to “sell your possessions, and give to the needy” (Luke 12:33), in imitation of the early church, which did just that (Acts 2:44-45). If anything, the New Testament is even more radical in its teaching on this matter than Calvin was. Comments Off on Calvin thought your church should devote half of its wealth to the poor. Does it? Many of the early church fathers, such as Ambrose and Augustine, argued that private property, like civil government, was a result of the fall. They believed that God had given material resources to human beings in common, and that individual persons would only have possessed such resources under the principle of stewardship. According to that principle, how I use my possessions for the good of others is just as important as my right to use those possessions in the first place. Now in all of this I have said very little about civil government. Yet it is fascinating to see that virtually all of those who objected to what I have written in one way or another engages the issue on a political – or specifically an Americanized political – level. Very few critics actually engaged the substance of the Christian tradition. Many American Christians, it seems, even those most worried about nefarious doctrines like that of the two kingdoms, don’t like having their modern assumptions about property and the poor tested by the actual substance of Christian theology. They judge Christian theology from the perspective of their American political convictions, rather than the other way around (though they often baptize their political convictions as Christian in the process). 1) In contrast to the Christian tradition, which has generally viewed both property and civil government as good but as the results of the Fall, American Christians tend to view civil government as highly suspect and private property as nothing less than sacred. And although there is a general consensus that God appointed civil government as his minister to enforce – i.e., coerce – justice, there is a marked reluctance to view government as having even the right (i.e., authority) to tax property holders for the sake of ensuring justice for the poor. Note, this objection is not simply an objection to the manner in which government is using tax revenues to protect the poor. There are plenty of good Christian reasons, for instance, to oppose communism or even socialism on the grounds that 1) they do not work; 2) they are often destructive of civil society; and 3) they hurt the very poor they are trying to help. But many libertarians will not even allow us to consider or debate the best ways in which government should help the poor. They question the notion that government should help the poor at all because they reject the Christian notion that an individual’s property rights are qualified by the more basic rights of the community or in particular of the needy. 2) Many American Christians believe whether or not a person is poor should be determined based on that person’s income or possessions. On that basis, they say, there are virtually no poor people in America, and there are certainly no responsible people who are poor. But this assumption is hardly biblical (not to mention the fact that it ignores the fact that the reason there are so few poor in America is because government helps those who would otherwise be poor). In Scripture the concept of the poor is much broader than an assessment of economic resources suggests. The poor are those who are 1) oppressed or vulnerable to oppression; 2) excluded from meaningful participation in the community; 3) lacking the basic resources necessary for life. The specific examples Scripture often provides of those who are poor are slaves, immigrants, women without husbands, and children without fathers. Now anyone remotely familiar with American society knows that these groups make up a significant percentage of the American population. While many of the “widows and fatherless” in our society are what they are because they’ve been abandoned by irresponsible men rather than because those men died, that hardly changes their basic plight. 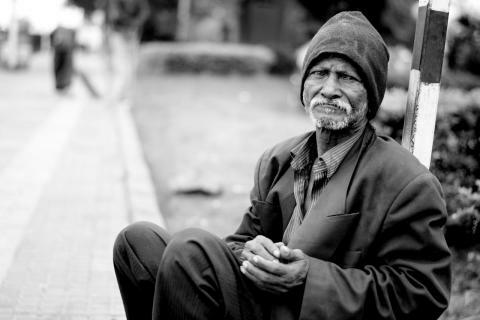 The poor are still with us (as Jesus said they would be), and it is good that our government seeks to protect them. Now none of this dictates that any particular policy or program is the appropriate way to protect or help the poor. Civil government should not be equated with civil society (or the rights of the community and the poor), and the first level of support for the poor and for one another should come through the organic structures of civil society. This is a fundamental point needing recognition in a society that wants to be free, and a point often ignored by well-meaning folks on the Left. But I also believe government has a responsibility to make sure this happens, and it seems, increasingly, as if this point is acknowledged by fewer and fewer on the Right (to their own political and moral disadvantage). It is true that many government programs designed to protect or help the poor have actually done them great harm. Dependency is never a good thing, and America seems to be becoming an increasingly dependent society. But the dependent, contrary to popular perception, are not simply the poor. Most of the programs that are redistributive in this country, whether through grants, entitlements, or tax credits, redistribute resources directly to the middle class or to the wealthy because they are not means-tested (think education, Medicare, Social Security, the mortgage tax credit, lavish public pension programs, and the plethora of subsidies for various businesses, industries, or research programs). It is obviously true that American government is too big and in too much debt. But it is not Medicaid, nor is it basic provision for the poor, that is bankrupting the country. It is clear that we need to have, and are having, an open debate about the future of America, and about the nature of government’s responsibility to its citizens. But whatever positions Christians advocate in this debate – and we should advocate positions that make sense economically, politically, and morally – we should not forget the teaching of our own theology. Calvin argued from Scripture that a magistrate will be judged based on how well he protects the poor under his charge. In a democracy, when we are all magistrates insofar as we influence legislation or political debate, we should be mindful that we will be judged on the same basis.